The TEACH tool is a five step process of conflict resolution that will bring you closer to what you really want - COOPERATION. This process of communicating respects and honors needs and feelings, and releases stress-relieving hormones, like oxytocin, to soothe the brain. 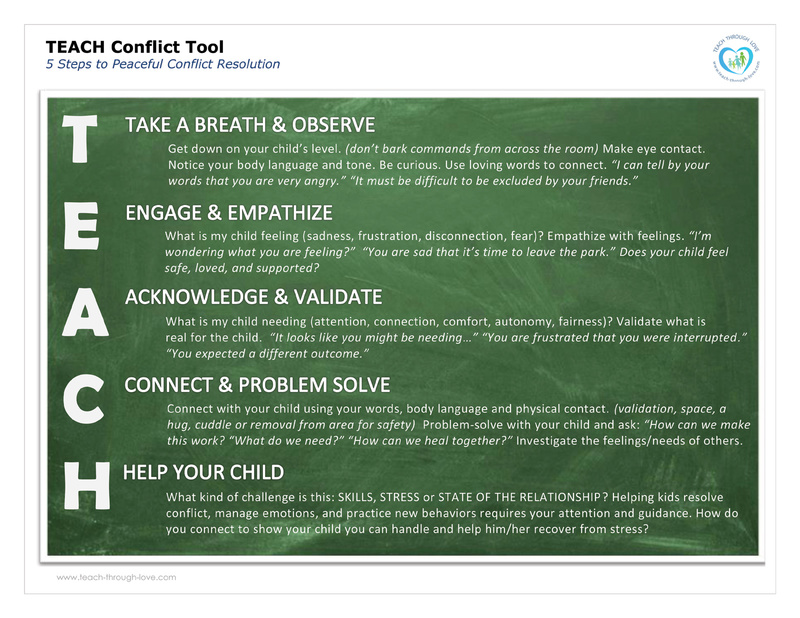 Peaceful conflict resolution with the TEACH tool teaches problem-solving skills AND strengthens your relationship, which is a key component to achieving long-term influence in your child's world. You CAN stay connected to your kids even when a limit requires you to be firm. You just have to BE OKAY with a bit of feeling. You can set limits compassionately if you remember a few simple steps. Forget yelling, threatening, pleading, begging or bargaining and start building RELATIONSHIP! 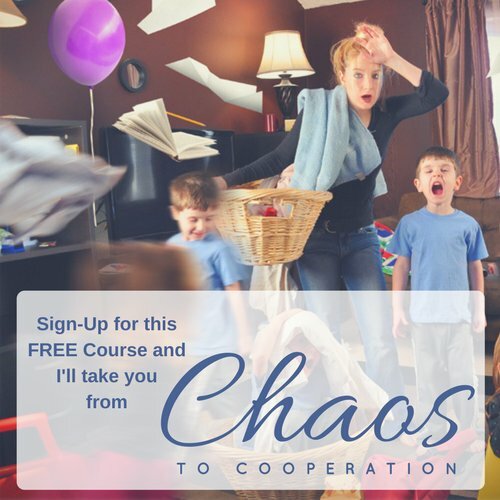 When you follow this simple 5-step method you will see your child's level of cooperation rise and his ability to be flexible grow as you begin to regulate your own emotions, validate feelings, recognize needs, and then problem-solve together, providing for your child a positive model of managing stress. It's important to remember that while behavior may not always be acceptable or allowed, feelings should always be accepted and validated. Our emotions hold crucial information about what we need and it is the job of emotionally aware adults to model appropriate behaviors and alternatives to meeting those needs, instead of simply saying, "No," "Don't," and "Stop!" Find the YES! in your children's requests. Support their feelings so that they know they can survive even the most painful times and disappointing situations. Traditional parenting uses a punitive model of shame, blame, judgment and guilt. These methods focus on achieving change by correcting behaviors, and thus inadvertently ignore or dismiss a child's feelings. You don't have to allow negative behavior to validate emotions but you must validate emotions to experience change. Labeling emotions is necessary for young children working through a tough time. Naming emotions for smaller kids helps them process their feelings and gives them the words to describe what they are experiencing - that they can recall the next time it happens. Reflecting your understanding of their emotions helps older children calm the stress they are feeling so they can move on to solutions. T - E - A - C - H is a FIVE step process. Don't be in a rush to solve problems if your child is overly emotional, resistant or aggressive. These are clues that your child is in a dysregulated state and not open or able to retain any meaningful learning. His brain simply won't let him "get there." Rationalizing your limits will only drive you MAD! Imposing your will and control brings you more disconnection and behavioral problems, and no closer to soothing your upset child. A child experiencing strong emotions, fear and in a state of stress (READ: negative behavior) cannot listen, learn or remember what you are saying to him. The priority needs to be on regulating the stress-response system through physical tools, deep listening and empathetic communication. This will bring about a physiological state that allows brain cells to connect and positive behaviors to return. It is through relationship that you will change behavior. The first three steps are the hardest as sometimes the most draining. Don't rush it. Hang out and have a cup of T - E - A - before moving on to connecting solutions.